Day one of the three-day strike, held by AFSCME Local 3299 in solidarity with Patient Care Technical Unit, began early Tuesday morning. 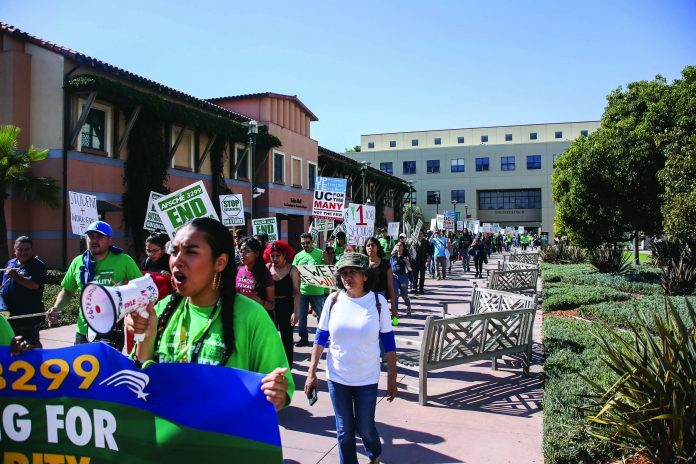 Union members and students marched collectively, setting up picket lines throughout UC Santa Barbara’s campus. The decision to strike was settled after 96 percent of AFSCME Local 3299 union members voted in favor. Drawing to a close on Thursday evening, Oct. 25, the three-day worker strike sought to protest against the outsourcing of UC worker jobs to outside companies, a practice that exploits workers with unfair wages and few healthcare benefits. This threat grew after UC announced last month that they would enforce employment terms that would raise healthcare premiums, lift the retirement age, and lower wages for more than 15,000 UC Patient Care Technical Workers. In response, AFSCME International President Lee Saunders called UC executives a “bastion of inequality,” claiming that executives revel in slush funds while workers struggle to make ends meet, per AFSCME press release. Beginning their march each day around 6 a.m., union workers included Cheadle Hall on their route, arriving at approximately 9 a.m. to speak with Chancellor Henry T. Yang at his fifth floor office. Told that Yang was not present, they instead spoke with Executive Assistant Diane O’ Brien, sharing their grievances over unfair worker contracts. Hours later, the rallying continued at Storke lawn as more students and supporters gathered alongside workers to hear what speakers had to say. Just after 12 a.m., as the marching moved towards Davidson Library, campus organizations like United Student Labor Action Coalition (USLAC), Mujeres Unidas por Justicia, Educacion y Revolucion (M.U.J.E.R), and KCSB also held up banners in support as they marched together with the union. Protesters also set up picket lines at Henley Gate, where vehicles were heard honking in solidarity. Many of the sentiments heard throughout the day pointed towards the value of students coming together to support workers. Jarrod, a full-time groundskeeper at the west campus apartments, believes that worker-student solidarity will help create awareness to end outsourcing and get a favorable contract. Last year, UC agreed to raise the salaries of eight UC chancellors by three percent, an average of about $15,000 more each year. Meanwhile, 44 percent of UC undergraduate students experience food insecurity, according to a national survey. Amongst the second day’s speakers were Santa Barbara mayor Cathy Murillo, citing her support for the strike, and Jay Stemmle, an academic skills tutor from Campus Learning Assistance Services (CLAS). “This is what my boss wrote to me yesterday – ‘your failure to report to work will be considered insubordination/serious misconduct. Your actions will be subject to discipline’,” said Stemmle. Stemmle encouraged workers to know and to take control of their own rights, citing the fact that she had every right to strike even though her boss told her she didn’t.